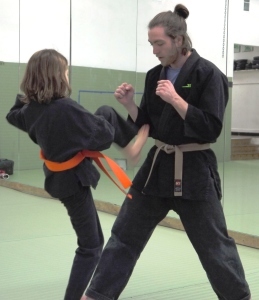 Anyone interested in training at Progressive Martial Arts can start with an introduction package. The package consists of four half-hour private lessons and one hour-long group class, all by appointment. The cost for the introductory package is $50. This approach allows the student to “try out” the school, meet different staff members, view the curriculum and get a general feeling for the school’s atmosphere. We feel that students can then make an informed, intelligent decision about continuing his or her training. The introductory period also affords parents the opportunity to view their children so they can determine, along with the staff, if their child is serious enough and mature enough, and has the adequate attention span, to train in the martial arts at this time. Call us today at 303.455.0222 to schedule your first appointment!